Lookin' good. There are only a few region name placements that could use adjustment I think, for instance: Univ City (the abbrev), Juniata, and maybe a couple more. The graffiti comes to life now. - Inset of Center City has streight lines at the right side that make it look unifinished and overlaps with the pipe/raingutter. - Legend has the old colours. Looks good. 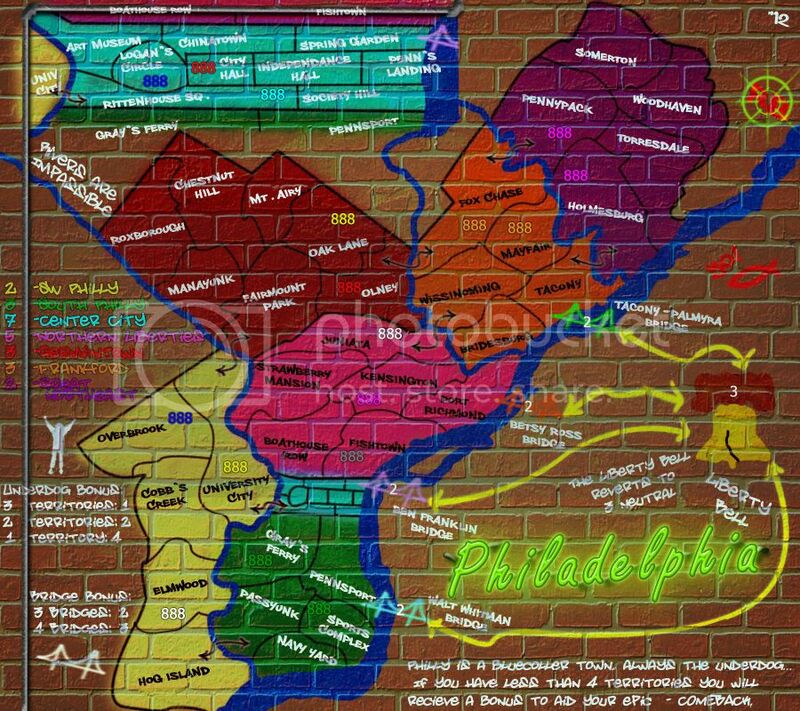 Some of the arrow connections could be clearer like Holmesburg to Tacony for example. 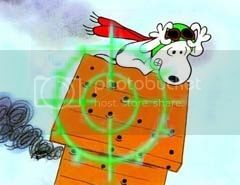 Ah yes, this is looking more like graffiti now!! As for the city center inset, yes the paint needs to on the pipes as well. I agree that the attack arrows between regions need to stand out more, maybe add an outer glow? Well I think the graffiti look has really improved. However, i think there is no flow to this map. Probably because of all the outlining instructions and images and arrows. The map is unique, however I'm not a fan. With this cleaned up Large version... I'm hoping its enough to get the small taken care of and get done here, I work slowly I know, but lets see if this can't get this done! The city inset - I think the text needs to be black instead of the white. With the white text and the bright blue, it is just waaaaayyyyy to glaring. isaiah40 wrote: The city inset - I think the text needs to be black instead of the white. With the white text and the bright blue, it is just waaaaayyyyy to glaring. I don't understand the Liberty Bell; why is it connected to the bridges? Shouldn't it be New Jersey? Also, the brick background makes the map hard to see in general. RBO, i admire your tenacity in working on this...it has taken such a long time for you to arrive at something you like. and imho, it is starting to look good. 4. agree with Andy on the background colour of the city...last colour is my pick. 5. on some writings under the brick mortar, some white is blended in with the mortar colour instead of sitting on top of it....makes it look weird for me because the title and other colours in bridges etc goes straight over the top of the mortar....is your text layering sitting behind the mortar layer? 7. your signature....is that it top right corner or is that a compass? cairnswk wrote: RBO, i admire your tenacity in working on this...it has taken such a long time for you to arrive at something you like. and imho, it is starting to look good. I wasn't planning on it, but I can try it and see how it looks. Boathouse Row and Fishtown, it was a suggestion further back to get the names more onto the pipe, I can work on those. Probably go with a dark brown. cairnswk wrote: 4. agree with Andy on the background colour of the city...last colour is my pick. Already fiddled with and hopefully taken care of. cairnswk wrote: 5. on some writings under the brick mortar, some white is blended in with the mortar colour instead of sitting on top of it....makes it look weird for me because the title and other colours in bridges etc goes straight over the top of the mortar....is your text layering sitting behind the mortar layer? cairnswk wrote: 7. your signature....is that it top right corner or is that a compass? um... opps? kinda makes more "graffiti" now doesn't it? I'll... redraw it some, try not to have it... look so suggestive. Have to nitpick here, but "less than 4 territories" should be "fewer than 4 territories". In fact, 'territories' might be better as 'regions' just to be consistent with the game log. ManBungalow wrote: Have to nitpick here, but "less than 4 territories" should be "fewer than 4 territories". To add on to this, "Bluecoller" should be "Blue Collar." It's two words, not one, and collar is spelled wrong. This should cover all the issues mentioned so far. My own issues with this are the 2 inset region names on the pipes, I don't think they've integrated into the map correctly and I'll likely have to do something there, and my main question about the outline of the map itself. Help me decide kids, I personally lean towards NO outline, but I wanna be sure. I also prefer no outline, but you can get away with either IMO. Is that the pipe segment at the top connected to various other layers now? Otherwise, you could try the simple solution of removing that horizontal segment. Or you could do a horizontal flip of the pipe layer, so it goes out of the left margin instead of through the region names. If there's a real issue and the names there are deemed absolutely necessary (it's good to have them there for completeness), consider that people can simply write on pipes in chalk/marker pens etc. - it doesn't have to be the spray paint stuff. I prefer the outline myself...just gives that finished apppearance, and it's a continuation of the black border appearance...with no outline it looks unfinished. Also, you'ge still got something phallic going on in the blue inset section in the map...deliberate? all other text except the legend bonus text is clear - can you put a black offset under layer behind those names and numbers just to make them stand out more legibly. ManBungalow wrote: ... do a horizontal flip of the pipe layer, so it goes out of the left margin instead of through the region names. This is my thought exactly!! Or you could have it go straight up as well. I prefer the outlines, but if you go that route, I recommend to get rid of the "overspray" on the outside of the outlines. I've never seen any graffiti that looked like it had a lot of overspray. 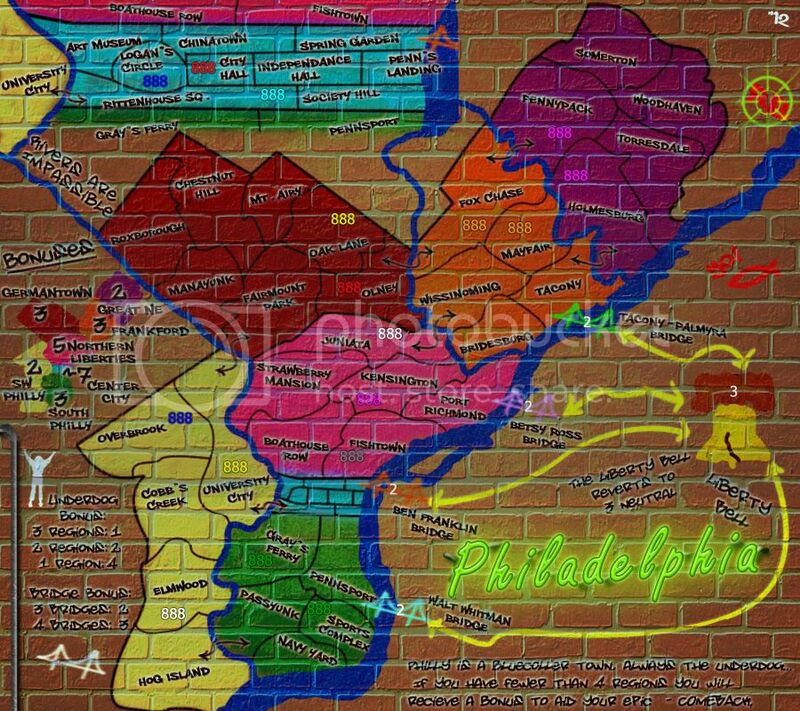 Re: Philadelphia - [4 October 2012] pg 33-Minimap? I'm hoping I've cleared up everyone's issues, in doing so I'm toying with a minimap instead of the list. So far I'm liking it, the colored list was just interacting too much with the bricks and and causing me trouble, I can fiddle more with the theme to get the list to work, a poster or neon perhaps. But lets see what the mini map turns up. 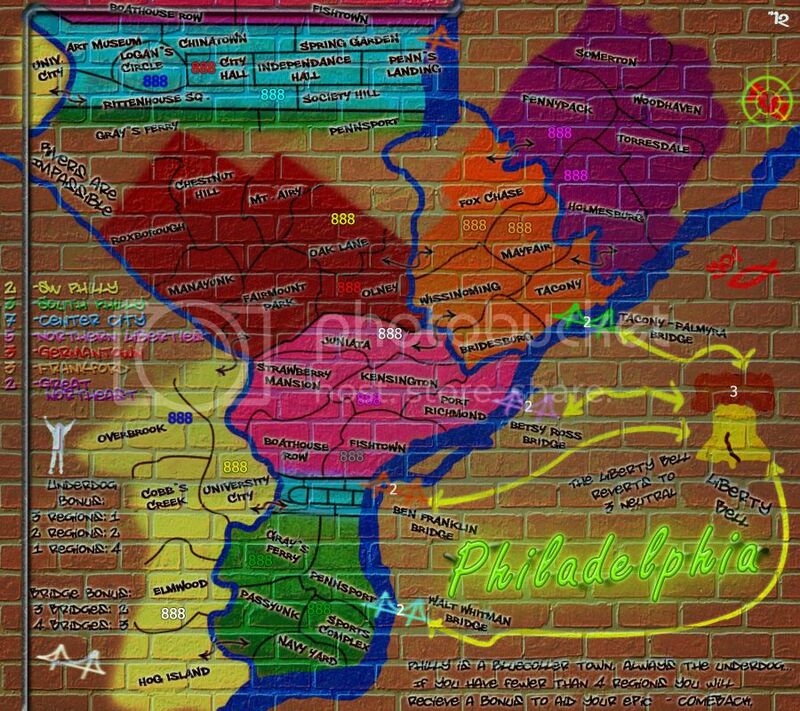 Re: Philadelphia - [3 November 2012] pg 33-Minimap? Liking the look of it. The only thing that sort of comes to mind now is that the legend text isn't as easy to read as say the gameboard text for the regions, probably because it is in a more fluid and writing style. *poke, poke* How's this coming kiddo!! isaiah40 wrote: *poke, poke* How's this coming kiddo!! I love the underdog factor, that is so unique. Beautiful map!